Okay. 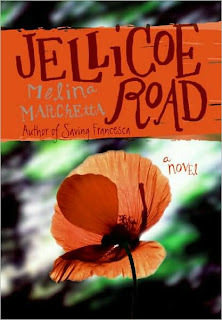 We'll start with Jellicoe Road because it's the one I read first. I picked it up as a result of Trisha's glowing, cryptic in a good way review and the fact that it came away with the Printz Award this year. It is Australian Melina Marchetta's third book and the first of hers I've read. A fault that will have to be remedied quickly as I absolutely loved this knotty, painful, beautiful book. Taylor Markham is head of her house at the Jellicoe School--a backwoods boarding school located somewhere in Australia. Abandoned by her mother at a 7-Eleven on the Jellicoe Road, Taylor was taken in by a mysterious woman named Hannah and installed at the school. Now eighteen, Taylor is embroiled in turf wars between the Jellicoe students, the Townies, and the Cadets. But when Hannah up and leaves without a word, Taylor is convinced it has something to do with her mother and with a horrific accident that happened on the Jellicoe Road twenty-two years before. Past and present become harder to discern as the story unfolds. Simultaneously obsessed with and terrified of finding out what happened and just how closely it is tied to her own fragmented life, Taylor is forced to form alliances with the leaders of her rival gangs, including Cadet leader Jonah Griggs with whom she shares a confusing and painful history. This story grabbed me by the throat and shook me until I begged for mercy. Parts of it read almost stream of consciousness and you have to just let it wash over you as characters and histories distill and become clearer on the page and in your mind at about the same pace they do for Taylor herself. And by the time the wars really begin, you are so invested it's impossible to extricate yourself from the world Marchetta has created. Fortunately you don't want to. I was charmed by the dust and heat of the Australian summer, the layered language with its overtones of fear and longing, and the periodic chapters detailing the story of five children who were determined to survive after the world ended. This book will both stop your heart and then remind you how to breathe again. It's gorgeous and deserves every accolades it gets. I'm just reading this right now and I'm REALLY enjoying it. A little slow in the beginning, but it got better fast. I fell absolutely in love with this book. And definitely do read Marchetta's others - they're all wonderful. Janssen, it gets SO good. Somehow it managed to make me feel like I was both creeping and rushing headlong toward the conclusion. Biblauragraphy, I picked up Saving Francesca at the library the other day and hope to get to it soon! I really liked Marchetta's first two novels Looking for Alibrandi and Saving Francesca. I didn't know she had written more! I will definitely be picking this up. Hope you enjoy it, Emily. I'll be looking for those first two! Such a good way to put it. Parts of it read almost stream of consciousness and you have to just let it wash over you as characters and histories distill and become clearer on the page and in your mind at about the same pace they do for Taylor herself. Trisha, *blush*. Thank you! Your review really did the trick, though, as I had to go out and get it despite knowing very little of what it was about. And I'm so glad I got to go into it with no preconceptions whatsoever. So thank you! Such a great review. I read this book in January (and just reviewed it at my blog) mostly because of your wonderful review, as I do not generally read YA contemporary. So, thank you thank you. I loved it so much.